Richard Ronald is Professor of Housing, Society and Space in the Department of Geography, Planning and International Development and at the Centre for Urban Studies at the University of Amsterdam. In this interview, Ronald talks about the big shift in housing—how housing went from a source of shelter to become a commodity. He also talks about the impact of global capital and the side effects of the commodification of the housing market. Hites Ahir: How has the distribution of housing wealth changed over time? Richard Ronald: While housing wealth, like other kinds of asset wealth, was once heavily concentrated at the top of society, the expansion of homeownership in the second half of the twentieth century generated a much wider distribution across income classes. As such, across most developed economies (especially the English speaking ones) many low to middle income households who acquired their homes in the 1970s and 1980s (and before) when prices were historically much lower, have now paid off their loans and accrued significant equity. Since the turn of the century however, and especially since the Global Financial Crisis, the pattern of gains made by homebuyers has become far more uneven. Geography has played a role in that there are growing price disparities between neighbourhoods, cities and regions. Timing has also been meaningful, with later market arrivals accumulating far less housing wealth but assuming much more risk. Significant inequities between lower and higher income homeowners have also reasserted themselves with the former suffering most from the effects of the crisis and the later benefiting more from recent market recovery. Essentially, the distribution of homeownership has shrunk in most contexts and housing wealth become more concentrated again. (See a video on the HOUWEL research project. This project is tackling crucial questions such as: What factors are undermining entry to homeownership? How are these reflected in growing inequalities?). Hites Ahir: Housing Wealth and Welfare—is a new book that you co-edited with Caroline Dewilde (Tilburg University). The book points out that traditionally, housing performed the function of shelter. However, this has changed. Housing is now seen as an investment, asset accumulation, speculation, and so on. What led to this change? Richard Ronald: In the longue durée, state, individual and market approaches to housing have shown a remarkable reorientation. Postwar housing crises often reflected real shortages in terms of units and space per household, and governments became far more proactive as suppliers of housing. For most households, a home was a home, with your tenure status saying little about your social standing or economic security. Renting out housing property, meanwhile, was also in decline, with other sectors much more attractive to investors. Since the 1980s, however, a combination of factors have reoriented societies around housing. First, in line with growing fiscal pressures – not least the growing costs of the welfare state – most governments pulled away from the direct supply of housing. In policy, facilitating greater marketization represented an obvious alternative in terms of provision, although extending homeownership (over renting) also offered a means to orientate individual households more squarely around their homes as wealth accumulation vehicles that would make them more self-reliant. Second was the advance of global finance, which increasingly dominated residential real estate practices and connected global money with local property markets. Together, these factors facilitated a transformation in the circulation and use of dwellings: from places where we live to the primary means by which households and families (rich and not so rich) can store and nurture their wealth. The increasing focus on housing as a commodity also enhanced its attractiveness as a speculative vehicle, with property investors increasingly competing with, and often pushing out, home-buyers. Hites Ahir: How have these developments affected housing markets, particularly homeownership? Richard Ronald: In the pre-crisis period, financialization initially supported homeownership as the supply of credit surged along with the intensified trade in debt. The historic increase in homeownership rates across developed societies thus continued into the early-2000s along with other pro-homeownership policies and tax incentives. Since then, nonetheless, homeownership rates have been in decline, and in the UK and the US fell from around 70 percent to just over 63 percent in just over a decade. Similar patterns, often longer standing ones, have also been evident in contexts such as Ireland, Australia and New Zealand, but also Japan and South Korea. The drying up of credit since the GFC has been one factor in this, although there has also been a particular generational dynamic with declining homeownership rates reflecting a sharp drop in market entry among younger adults. At the same time, significant wealth has surged into housing markets, often from older, well leveraged households, buying up property to let out to satisfy the growing demand for rental housing among those who can no longer access homeownership. 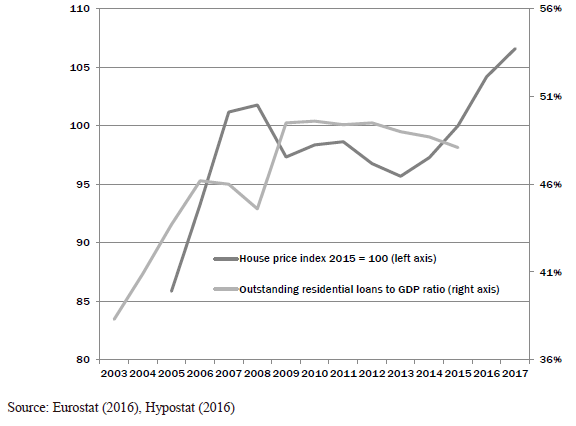 Indeed, as figure 1. below illustrates for Europe, recent house price recovery has not been paralleled by growth in debt, reflecting flows of wealth from elsewhere (individuals and funds buying up housing (to rent)). Hites Ahir: What has this meant for policymakers? Richard Ronald: Shifts in housing markets and conditions have been difficult for policy makers to both comprehend and manage. Declining homeownership rates are often understood as a function of affordability, meaning that policy initiatives have typically sought to prop-up (subsidize) home buying, especially among first-time buyers. This has often done little other than revive house price inflation and thus aggravate the affordability issue. Affordability has become a far more complex problem. Critically, the strength of the relationship between income and house prices has been undermined by the capacity of equity rich homeowners to take money from elsewhere and either buy extra property (to let), or pass onto their children in order to get them into the owner-occupied market. This had been further aggravated by more global flows of capital into high performing markets. What is required is for policy makers to consider that past house prices and homeownership rates were unsustainable, and that a more robust housing system may be one that looks far more heterogeneous with a mix of market and non-market elements. A greater diversity of tenures serving different kinds of household and income groups at different points in the life course is more likely to relieve the pressures on housing without necessarily undermining values. Many countries across Europe have mature social rental housing sectors that could be adapted by policy makers to serve housing needs. The revival of private renting may also not be such a bad thing if managed effectively. Hites Ahir: In the book, you also point out that in the post-Global Financial Crisis context, global capital and finance appears to be flowing into the actual procurement of residential real estate rather than investment in securities. Could you elaborate on this point? Richard Ronald: Before the crisis it seemed that housing and homeownership was reshaping the global economy in relation to the capacity of mortgage finance to be packaged (and repackaged), and circulated around the world. While the GFC undermined this, global capital has continued to adapt housing to the interests of wealth accumulation. Buying up housing property (rather than debt) has proved to be lucrative with the crisis itself initially eroding prices and presenting housing as an opportunity for those with money looking for a solid return in a risky or low yield market. Since then, global capital seems to have descended on a number of housing markets, especially urban ones, with cross-border real estate buying increasing 334 percent between 2009 and 2015. On the one hand has been ‘buy to leave’ investment, with wealth flowing from around the world into cities like Vancouver, London, New York and Sydney, and into properties that are left vacant in the context of rising prices (often driven by this very process) and a view to future capital gains. On the other has been a swell in ‘buy to let’ activities involving both local and international investors buying up properties in order to generate rental income. While there have been large scale investors, from hedge to pension funds, private individuals seeking to buy just one or two units have had a major influence on how international money has flowed into housing. In many cases, real estate service providers have adapted quickly from sales to letting transactions. Mortgage providers have also reacted with increased finance for high equity homeowners seeking to buy extra property. At the same time, many countries have seen increases in cash buys in contexts of very low interest rates. Hites Ahir: How have policymakers dealt with these developments? Richard Ronald: Governments have been characteristically ambivalent towards the resurgence in house prices and global investment. The initial reaction was to welcome the revival of property prices stimulated by investment activity. However, policy makers have more recently begun to recognize the negative impact of global financial flows on local housing markets as well as the dangers of intensified investment in the private rental sector. The exclusion of younger would-be home buyers and declining housing access and affordability overall have also become more politically sensitive issues and governments have been forced to act. In Vancouver, for example, where Asian investors have historically been nurtured, the local government has now sought to dampen international flows with, in 2016, a 15 percent tax levied on foreign housing property purchases. This was followed in 2017 with a 1 percent tax on empty properties with the hope of further undermining buy to leave practices. Other Canadian cities are now following suit. In the UK, by contrast, little has yet been done to combat foreign buyers although the Conservative government has attempted to subdue buy to let activities more generally by implementing (since April 2016) a surcharge of 3 percent on individuals buying a second property to let as well as reducing the tax deductibility of mortgage interest costs on landlord incomes. Hites Ahir: Has the commodification and financialization of housing been even across countries? Richard Ronald: On the one hand, mortgage securitization in the 2000s had broad affects as even those countries with relatively secure lending practices were affected by the shift in global flows of credit and debt when the crisis hit, as well as by the broader economic downturn. On the other, the crisis exposed key differences in housing market practices that has sustained an ongoing polarization in transactions and values. Spain is a good example as the mortgage sector there was not particularly financialized before 2002, although the construction of housing had become central to macro-economic growth, with mortgage lending on the rise leading up to the crisis. The market downturn there revealed the scale of imbalance between supply and demand and it has taken considerable time to absorb the previous overproduction of housing. Sweden, by contrast had a relatively stable housing system with a large sector of non-market rentals, and has subsequently experienced a considerable upturn in housing values since the crisis. Hites Ahir: With the commodification and financialization of housing, has housing been a driver of socioeconomic equality or inequality? Richard Ronald: The promotion of homeownership has been embraced by a broad range of political parties under the premise that wider property ownership will enhance the spread of assets and wealth across the population. In many cases this held true for the first cohorts of postwar owner-occupiers who benefited from largely unrepeatable price increases. However, even before the crisis, it was becoming evident that property ownership is highly fragmented and those on the highest salaries are advantaged most by upward house price shifts, while those on lower salaries are most vulnerable to market downturns. With the advance of homeownership more and more people have felt compelled to buy, but also ended up both borrowing and paying more for housing. They have, typically, also become more vulnerable to losing their home should they become unemployed or divorced. In the longer run, the divide between renters and owners has become a more meaningful one in the sense that being the son or daughter of a home owner represents a potential property inheritance or, more significantly, access to intergenerational assistance in getting access to the owner-occupied market. This is critical as paying off a mortgage debt over the life-course has become so much more important as a means of accumulating wealth, but also because, with the erosion of public services and spending, to achieving economic and welfare security in later life. Hites Ahir: How has the financialization of housing affected young and low-income households? Richard Ronald: Well this is a key question. The decline in homeownership rates is being driven by a sharp fall in younger people becoming owner-occupiers. 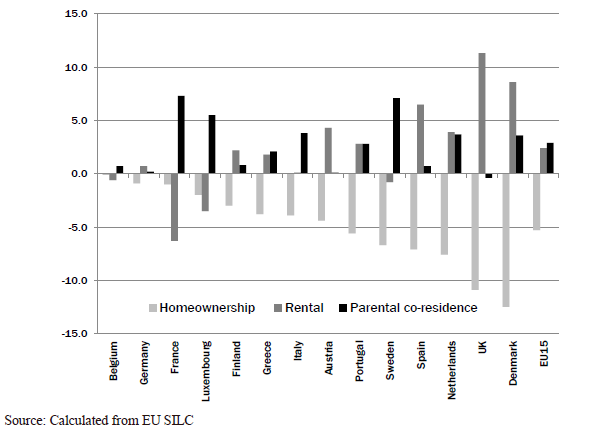 Across Europe there has been a marked rise in new households becoming renters rather than buyers, but also meaningful increases in younger people boomeranging back to the parental home, or not leaving home at all (Figure 2). The tightening up of mortgage lending is one reason younger people are renting more and buying less, although this pattern was evident in the years before the crisis in many countries as price increases began to outpace both income and credit. Also significant are the economic conditions faced by younger people in terms of income and access to stable employment contracts, which have deteriorated meaningfully in the last decade. The label, ‘Generation Rent’ has thus become common parlance across a number of countries and while it indicates intergenerational inequalities in tenure, it actually signifies a broader package of inequality. Moreover, Generation Rent also features sharp intra-generational inequalities that reflect and reinforce social class and income. Indeed, while homeownership rates have dropped among younger adults overall, they have typically increased among the highest income deciles. One reaction to discussions of Generation Rent has been to assert that entry to homeownership is just being delayed within this particular cohort. However, the evidence is beginning to suggest that lower homeownership rates will persist and that a much larger proportion of the population will remain renters throughout their lives. Becoming a home owner will hinge for many younger people on whether they will get an inter-vivo gift, or perhaps inherit later in life from their parents. In the UK, a key illustration of this lies in emerging mortgage practices, with parents involved in more than 25 percent of all property transactions in 2016. Parental gifts had a total estimated value of £5 billion last year and are expected to increase 30 percent to £6.5 billion in 2017. What policy makers often fail to grasp is that routes through housing careers have far broader consequences. For many millennials, not being able to get out of renting and into homeownership may diminish their incentives to, or chances of, partnering and having children, as most people delay serious life course transitions until they establish a normatively appropriate or financially secure home. Moreover, if there are more renters in old age in future, more people will require more resources in retirement to pay rent (retired outright owner have low housing costs) and fewer will be able to dip into their housing wealth in times of hardship. Hites Ahir: Is it correct to say that in many countries, we have seen subsidies flowing towards initiatives to sustain homeownership rather than ameliorating poor housing conditions? Why? Richard Ronald: Like individual parents, governments have largely sought to provide extra assistance (via various schemes and discounts) for younger people seeking to get onto the property ladder. These programs often represent the redirection of housing subsidies from those with the greatest housing need (as shelter), to middle income earners seeking a tenure upgrade. We have briefly discussed above why governments do this, but the core reasoning lies with a logic surrounding the superiority of owning your own home over renting it. I think we need to break away from this. There are many good examples of successful rental societies and there is no meaningful link between the economic success of a country and its tenure structure. If you take a look at Europe you will find the lowest rates of homeownership in Germany and Switzerland and the highest in Romania, Bulgaria and Albania.